From its earliest origins in 17th century Japan to its 21st century application at Precision MMA in Poughkeepsie, New York, the martial art of “Jiu-Jitsu” has been a way for smaller opponents to overcome their larger adversaries. Translated from Japanese, “Jiu” literally means “gentle” and “Jitsu”, “art”. Akiyama Shirobei Yoshitoki created the first style of Jiu-Jitsu, “The Willow School”, over 400 years ago based on the ability of the branches of willow trees to withstand large amounts of snow fall by yielding to the pressure. Though this martial art adapted over the years and became the basis for Judo and later Brazilian Jiu-Jitsu, the focus would remain the same: teaching students to prevail in fights by utilizing the least amount of force. In 20th century Brazil, Helio Gracie used these same principles to create the martial art of Brazilian Jiu-Jitsu. Growing up, Helio was a frail child. In fact, during most of his youth he was so weak due to illness that he could not even train and learned simply by watching his older brother Carlos in his lessons with Esae Maeda, the first Japanese foreigner to bring Jiu-Jitsu to Brazil. Later Helio’s physical weakness became Brazilian Jiu-Jitsu’s gain as he adapted the style to work for smaller and less athletic students. When his son Royce competed in the first Ultimate Fighting Championship in 1993, he too was smaller and weaker than most of his opponents, yet he overcame all of them by using superior technique and the principle of yielding. In fact, he defeated his first opponent in that tournament, the boxer Art Jimmerson, without landing one punch by simply taking him down and holding him in the mounted position until he became so frustrated he simply gave up and tapped out. Precision Mixed Martial Arts in Poughkeepsie, New York boasts a direct lineage all the way back to Helio Gracie who himself can trace his Jiu-Jitsu lineage back to the founder of the Willow School. The gentle art has spanned four centuries and thousands of miles from Japan to Brazil to Poughkeepsie, New York. However, the goal of Jiu-Jitsu instructors at Precision remains the same today as it did in antiquity: for the teacher to impart the lesson of yielding to his student so that he can use minimal effort for maximum effect. A Jiu-Jitsu practitioner wants to defeat his opponent by using as little strength as possible, and also by doing as little damage as possible to his attacker. In fact, one of the greatest current Brazilian Jiu-Jitsu black belts and UFC fighters, Demian Maia, has been quoted as saying that he believes the best expression of his expertise in this martial art is to be able to win a fight without once striking his opponent. Much like Maia, and similar to Royce Gracie in his first UFC fight, Precision Mixed Martial Arts in Poughkeepsie’s head instructor Brian McLaughlin won his first MMA fight without landing a single punch and without being hit once. In only twenty-two seconds, Brian tripped his opponent to the mat, established control, applied a choke and got him to submit. This is a perfect expression of the same martial art created centuries ago in Japan, and Brian imparts these same skills to his students during his martial arts classes in Poughkeepsie. One student at Precision who has learned the lesson of yielding as well as any is Brown Belt Karl Nemeth. Despite being only about 145lbs and smaller than most of his competition he is often able to use his technique to defeat much larger and stronger opponents in competition. The reason Karl is able to do this is because he grasps the concept of “yielding” that is so stressed in the martial art of Brazilian Jiu-Jitsu. When faced with a larger opponent, instead of trying to over power them or forcefully gain top position, he recognizes that his best course of action is to relax and use technique and flexibility to gain the upper hand. This is the essence of Jiu-Jitsu that the original “Willow School” was founded upon. Aside from physical “yielding”, Precision Mixed Martial Arts in Poughkeepsie, New York teaches the lesson of mental yielding as well. At Precision we do not train with egos. Beginning students often have a competitive mentality and do not want to submit while grappling, but they quickly learn that tapping is a part of regular training. In fact, if one trains regularly but is never submitted, it most likely means that they are not challenging themselves enough. In the long run, this lack of physical and mental challenge creates rigidity, and rigidity is the opposite of the “gentle way”. However, what is so great about the martial art of Jiu-Jitsu is that it can be trained at full speed without hurting one’s opponent. Two students can grapple at a high pace, and yet if one gets the other into a submission, it is easy to let go without causing harm. And while this principle is true of Brazilian Jiu-Jitsu as a whole, there are still schools whose teachers do not stress this enough. The practice of catch and release is emphasized at Precision Mixed Martial Arts in Poughkeepsie so that we can continue to train hard every day. 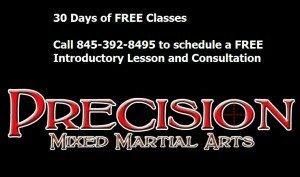 And finally, Precision MMA in Poughkeepsie is a school where it’s students are encouraged to think outside of the box. If one technique is not working, another may. We like to think that our students do not stick to one style or routine and that if need be, they can be as flexible as a willow branch. The essence of the martial art of Jiu-Jitsu has never changed: to overcome superior force through superior technique and flexibility of mind and body. Precision MMA in Poughkeepsie has not forgotten its roots in either ancient Japanese or 20th century Brazilian culture. What was a Hudson Valley boxer doing in Buffalo over the weekend? Well, Pat Daka was competing in the second round of the Upstate New York Golden Gloves. What you may not know is that Pat Daka is still just a teenager. Prom, graduation, and other high school rites of passage are still fresh in his mind. But this young pugilist enters the ring, just the same, ready to face down fully grown men who want to take his head off. Hudson Valley boxing’s Pat has shown that he does not scare easily. In the first round of the Golden Gloves, he faced an enormous 300-pound superheavyweight. Many counted out Precision boxing’s entrant, but Pat had other plans. Showing ring generalship generally only seen in hardened veterans, Pat worked with quick flurries and strong power shots in route to a dominant victory. Those who doubted him before knew he was business. He did not drive all the way from the Hudson Valley to box and leave empty handed. After he earned his victory, Pat immediately got back into training with Hudson Valley boxing coach Derrick Ohlhoff. Even though he won in dominant fashion, Pat was still focused on improving as a boxer and working on his weaknesses. In addition, he even took the initiative to step outside of his comfort zone and spar the top dogs at other Hudson Valley boxing gyms. Pat even stepped into the ring with Zuri Lawrence, a veteran of over 40 professional fights. While there were small hiccups and moments of doubt, Pat stayed on course and focused on his goal: to become a Golden Gloves champion. When February 16th finally arrived, Team Precision Boxer Pat Daka was ready to show what he was made of. While other fights were filled with self-doubt and anxiety, Pat was overflowing with confidence and eager anticipation. Coach Derrick gave his last minute instructions and they made their way to the ring to take on another mountain of a man. It wasn’t the man’s size that bothered Pat, though. He was facing a south paw. South paws are rare and pose a unique challenge for orthodox or right handed Hudson Valley boxers. When facing a south paw, everything is backwards. Boxers have to circle to their left and lead with their right despite countless rounds of doing the exact opposite. They often step on each other’s feet in an awkward attempt to gauge distance, where the opponent feels simultaneously too close and too far at the same time. While southpaws face similar challenges, they have one thing on their side – experience. They know what it feels like because most boxers are right-handed – 9 out of 10, to be exact. Meaning southpaws hone their strategy for righties while orthodox fighters might even have a lefty in their gym to work with. Pat knew that there was no turning back after the bell sounded for the start of the context, so the Hudson Valley boxer sat back and bided his time, trying to win the battle. Then Pat saw that his lead foot was outside his opponent’s, and he knew he was in line for a straight right hand. Pat fired right down the pipe and snapped the man’s head back like a Pez dispenser. His opponent retreated for a moment to collect himself, but Pat never gave him a chance to. He adjusted to his southpaw jitters and maintained constant pressure. Showing the mindset of a champion, Pat informed his coach that since he took very little damage, he would be ready to fight again on Saturday at another local boxing show near Poughkeepsie. With three victories under his belt, the future looks bright for Pat Daka and the rest of Team Precision Boxing. Keep your eye out for this young heavyweight with the thunderous right hand. I travel far and wide to train with the top martial artists I can find. When I come across a good thing I always try and share it with my students – I’ve lead many Precision MMA students from Poughkeepsie on field trips to some of the top MMA gyms in the Northeast. The comment that gets repeated to me the most during these trips is “That kid with the pony tail is REALLY good!” The long haired fellow in question is of course coach Karl. Striking or grappling Karl’s unique style and innovative techniques turn heads among even the best and brightest of the sport. The popular belief is that Karl was a martial arts protege who was hitting omoplatas and high kicks with surgical Precision from day 1. Few people realize that along the way to his current success Karl overcame deficiencies that would have scared away many. When Karl first came in to try out class he looked like Kurt Cobain after a hunger strike. He was very out of shape and initially could only take a few classes a week because his body couldn’t handle regular exercise. The experienced students would tie him in knots and the new guys could muscle him around. However, Karl had a secret weapon that would allow him to quickly rise through the ranks and achieve his martial arts goals. He had a thirst for knowledge and enjoyed the journey. While other students would beat their heads against walls if they couldn’t effortlessly tap everyone in class Karl had a smile on his face every time he would get submitted. Rather than taking nights off to party Karl would stay late and ask questions about mixed martial arts. Instead of being discouraged by the lack of immediate promotion Karl prepared himself for a long martial arts journey in Poughkeepsie. Helio Gracie once said “the primary objective of jiu-jitsu is to empower the weak”. The real magic of martial arts training is the transformation of a student from frail and unassuming to confident and powerful. The unfortunate part is that too often students fall short of fulfilling this incredible change due to frustration or lack of confidence. Karl’s progression didn’t happen overnight, but his passion for the martial arts and belief in his trainers carried him through the trying times. His progress is now a shining example of what is possible if you stay the course and enjoy the journey in Poughkeepsie Mixed Martial Arts. Technique coupled with dedication can overcome any physical disadvantage. Jean Jacques Machado became a Jiu-Jitsu world champion despite being born without fingers on his left hand, Anthony Robles becomes an NCAA National wrestling champion while having only 1 leg, Helio Gracie became the most influential fighter and martial artist of his generation yet as a youth he had fainting and dizziness so severe he was not allowed to take PE class. 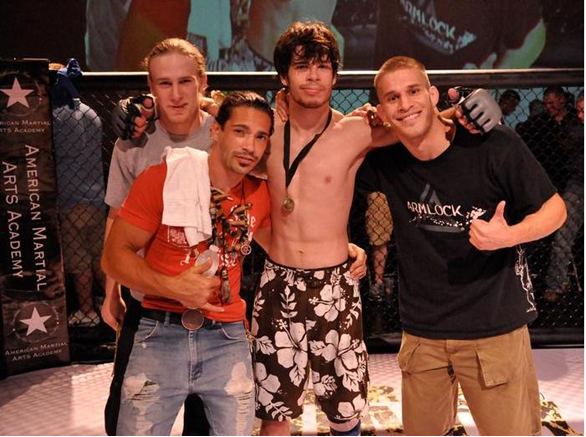 Natural ability and physical tools are hardly prerequisites for Poughkeepsie MMA success, a positive attitude and unyielding dedication will more than suffice. Want to learn more about how you can become a martial artists like Karl Nemeth? Give us a call at 845-392-8495 or drop in at 1097 Route 55, Lagrangeville NY. Most Poughkeepsie boxers are aware that the sweet science is not a new pass time. With it’s 18th century arrival in Europe and it’s various incarnations under Broughton Rules, London Prize Ring Rules, and finally the current Marquess of Queensberry Rules, boxing has been practiced for sport, fitness and self defense.What is fairly new, however, is it’s rapid growth in the Hudson Valley area of Poughkeepsie New York and it’s incorporation into the syllabus of Precision MMA in Poughkeepsie. Precision’s boxing program boasts instructors and training partners with extensive resumes in the sport. Our head boxing instructor, Derrick Ohlhoff, is a 3 times Golden Gloves boxing champion with an extensive winning record in amateur boxing competition who also has many years experience in coaching. He is arguably the most knowledgeable Poughkeepsie boxing trainer in the entire Hudson Valley. As such, his attention to detail is excellent, and anyone who takes his classes, from beginners to advanced students, will have much to learn from him. Likewise, our instructor Jon Russo has had several wins inside the boxing ring and has over twenty years of experience in the sport. Having trained in a wide variety of Martial Arts in addition to his boxing training, Jon’s approach to boxing is slightly different and is excellent not only for the ring, but also for street self defense. Jon is also a creative Poughkeepsie boxing instructor who is good at providing an atmosphere that is fun for students of all ages and he is excellent at coming up with entertaining new training exercises. John Joy is another Precision MMA boxing coach who has an impressive amateur record and has held the local AKBF Boxing title at 160lbs. Joy is also adept at teaching Poughkeepsie boxing students of all experience levels, but has a particular knack for explaining the fundamentals to beginners. There is no point in one’s boxing training where emphasis upon proper footwork, head movement and body mechanics is more important than during the beginning stages, and John instills this in everyone from day one. 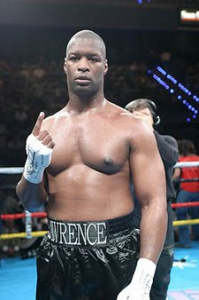 We are also extremely privileged to have training with us the premier professional Heavyweight boxer in the Hudson Valley in Zuri Lawrence. Zuri was at one point ranked as high as #12 in the world at Heavyweight and was so known for his skills that he was personally sought after and used as a training partner by none other than former World Heavyweight boxing champion Evander Holyfield. Soft spoken and affable, Zuri is excellent at explaining boxing’s finer points to beginners, intermediate, and advanced students. With such a wealth of experience in our instructors, our training environment reflects. We have a unique atmosphere at Precision which attracts all sorts of people since we are not a traditional boxing gym, we are a Mixed Martial Arts studio which offers a wealth of boxing classes and we reap the benefits of this setting. Those who come to our other classes without much interest in boxing may acquire a taste for it at a later point, especially when they see our brand new eighteen by eighteen foot ring. It might seem odd to those in the Poughkeepsie boxing world, but there are quite a few Mixed Martial Arts studios which offer boxing classes as an aside, but do not have an actual boxing ring in their facility. This works to their detriment if students are interested in stepping in the ring. However, at Precision those interested in competitive boxing can train in the proper environment. Students at Precision in MMA in Poughkeepsie New York often have different motivations for training. Some are simply there to enjoy themselves, which is easy to do since our instructors are easy going and open-minded. Generally, if one were to walk into the average Poughkeepsie boxing gym for no reason other than to find a new pass time a serious boxing coach might not give them as much attention as those preparing for in the ring combat. However, at Precision our instructors will take just as much time to teach boxing’s nuances to those there to have a good time as to the serious competitors. Some students are there for fitness, and with our program’s extensive focus on cardio and strength training this need is sure to be met. And finally, if one is interested in stepping into the ring then Precision’s program will prepare them better than any other in the Poughkeepsie or Hudson Valley region. We have had countless students use the boxing they learned at Precision to win amateur and Golden Gloves matches and we have also had students adapt those skills to win kickboxing, muay thai, amateur and professional Mixed Martial Arts fights. Above all else, safety is stressed in Precision’s boxing program and this is why it is so effective for students of all experience levels. Precision has the best safety record of any Poughkeepsie boxing gym in the Hudson Valley. Sparring is only allowed once a student has been attending classes and focusing on the basics for a significant period of time and before they take part our instructors make sure that they are capable of controlling their punching power so they do not present a risk to others. Once a student is permitted to spar, they must wear the proper safety gear at all times, including hand wraps, gloves, headgear, cup and mouthpiece. During sparring sessions the instructor’s watchful eye is on the students at all times to make sure that the proper rules are being obeyed and the proper precautions taken. The instructors place great emphasis on matching together partners of equal skill level. Beginners will not be placed with advanced students in heavy sparring scenarios. Nor will two beginners be paired off if it appears to the staff that their sessions may escalate into brawling. Great thought and care is put into matching up appropriate sparring partners to ensure the best possible results and to reduce any risks for injury. To conclude, Precision MMA’s Poughkeepsie boxing program leaves no student behind. The privilege of learning to box in a true Mixed Martial Arts school rather than a one dimensional boxing club gives our school a different angle from most, and we have seen the success for ourselves in the enjoyment of our students, as well as in the titles and trophies they have won through their hard work. Whether you are just starting out or have been boxing for years, whether your goal is fitness, self-defense or competition, Precision’s boxing program will adapt to meet your needs as an individual. There’s a theory that like feelings and outcomes are attracted to one another. That is to say that positive thought supersedes positive outcomes and inversely negative thoughts precipitate negative outcomes. While this may not be applicable to all situations, it certainly plays a factor in martial arts success. Here is my story about the law of attraction in Hudson Valley BJJ. I can remember being a blue belt and grappling with higher belts and getting demolished when doing BJJ in the Hudson Valley. I felt like there was nothing I could do to stop their attacks or start my own. When I would look down at the color across their waist I felt like tapping rapidly was the only thing I would be accomplishing. However, one day I was visiting a different academy on a no-gi night. This particular night things were going well for me and I felt like I was going to tap anyone who got on the mat with me. I had a great roll with a guy I’d never seen before. He was technical, but I was able to catch him in a few triangles setups I had been working. At the end of the class I had to leave, but my partner decided to stick around for the next class. I was shocked when I saw him pull out a tattered BJJ purple belt and strap it around his waist. I couldn’t believe that I actually pulled off submissions against a higher belt in Hudson Valley BJJ. I later saw that this purple belt was actually getting the better of many guys who I thought to be unstoppable. I realized then that the difference was largely mental. With the other high ranks I saw their belt color and assumed defeat before I even began. However, when I grappled confidently and without concern for my partners rank I was able to be successful. Although this realization helped me in practice, I still had mental hurdles that hindered my performance in competition. As a brown belt I entered the Abu Dhabi North American Qualifier. Abu Dhabi is the most prestigious grappling tournament in the world and only a handful of people get the honor of competing there. In order to earn my spot I had to win this qualifier. When I looked at my bracket there were about 30 people, but I was only concerned with one name – Enrico Cocco. Enrico was something of a grappling phenom who had beaten some really big names and earned a rock solid reputation – he had also earned a victory over me a few years back at a local tournament in Florida. I was relieved when I saw that he was on the opposite end of the bracket, we would only potentially meet in the semi-finals. I had a great day of grappling, easily winning my first three matches without getting a single point scored on me. I was one step away from the finals when I saw that I would indeed be facing Enrico. At that moment I felt completely defeated. I had convinced myself that there was no way I could beat him. He looked so dominating in his prior matches that I just assumed I’d be another notch on his belt. I stepped on the mat and shot into a guillotine choke, tapping out in less than 1 minute. Enrico then went on to win the tournament and earn a spot at Abu Dhabi. Afterward, I was so upset that I gave the match away mentally before even getting on the mat. A few weeks after Enrico beat me we found ourselves competing against each other once again. This time though, I convinced myself I would win and show my Hudson Valley BJJ skills. I pictured myself getting my hand raised and grappled confident that I not only “could” win, but that I WOULD win. Sure enough, after a back and forth match, I had my hand raised. There was no technical improvements from the last match, no greater physical preparation. Indeed the only difference was my mentality. I believed in my success and I reaped the benefits. Having faith in your personal potential for success, is often times the biggest determinant between the possible and the impossible. For centuries it was thought that no person could run a mile in under 4 minutes. However, once Roger Bannister achieved it for the first time everyone re-worked their understanding of possible. The result? Runners began hitting sub 4 minute miles everywhere, today even high schoolers can do it. The “Bannister Effect” was simply the Law of Attraction applied. Belief in success caused a new level of achievement. Even against seemingly impossible opposition, a focused belief can overcome. This is what I did with BJJ in the Hudson Valley. A common pitfall people fall into when confronted with a challenge is to tell themselves they cannot overcome it. They go forth assuming defeat and arrive at their failure as if it was complete inevitability. Muhammad Ali once said, “It’s lack of faith that makes people afraid of meeting challenges, and I believe in myself”. Think about your goals in martial arts and in your everyday life. If these goals are worthwhile to you then chase after them with a steadfast conviction that you will be successful and watch your limitations be redefined. 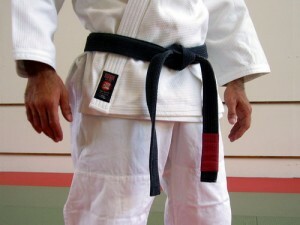 To learn more about hudson valley bjj, visit our website: poughkeepsiemixedmartialarts.com or call us at 845-392-8495! A lot has changed in the world of Brazilian Jiu-Jitsu since it was first used by Royce Gracie to win the first Ultimate Fighting Championship back in 1993. Back in the mid to late 90s, legitimate Poughkeepsie BJJ schools were very hard to come across, and if you were lucky enough to find one, chances are the instructor would not be a black belt or even close to expert level. Much of this was because the majority of black belts still resided in Brazil. Fast forward to 2013 and not only is it not a novelty for a small town like Poughkeepsie, NY to have a Brazilian Jiu-Jitsu school with a black belt instructor, but it is not uncommon for even very rural and sparsely populated areas to have more than one school, not to mention the competition in larger urban areas. Competition between BJJ schools is fierce these days and so each must try to offer the highest quality product and provide something that the others don’t so as to stand out and stay in business. 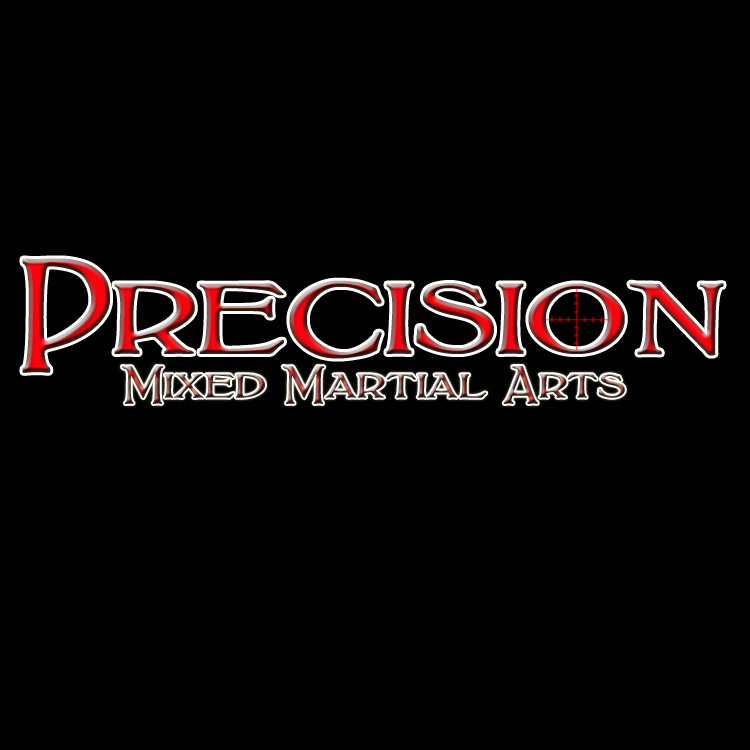 Precision MMA in Poughkeepsie New York is well aware of this competition, and because we truly care about our students we are constantly striving to provide the best instruction possible. Precision stands out from the competitors in many ways. One way we stand out is that we offer both Gi and No-Gi classes and equal emphasis on both. While this is becoming more common, there are still many schools which are mainly one or the other, but Precision caters to both styles equally. One of the more important ways in which our Poughkeepsie BJJ program stands out from others is that we place emphasis on takedowns. There are still far too many schools that grapple exclusively from the knees and the students do not even realize how much this hurts their games. All Jiu-Jitsu tournaments, MMA fights and street fights start from the feet, so whatever your motivation for training, if you are not learning takedowns your needs are not being met. In fact, when someone takes BJJ classes at Precision MMA in Poughkeepsie New York, they are not learning one style of grappling, they are learning seven separate styles. Our advanced no-gi classes are taught by two instructors who share the stage: a Brazilian Jiu-Jitsu black belt and Professional MMA fighter is there to teach the ground game, and then the takedown instruction is provided by one of any number of our division one wrestlers. As such, you will be learning not only BJJ, but Freestyle, Folk style and Greco-Roman Wrestling in our Jiu-Jitsu classes. We also have elements of Russian Sambo and Catch As Catch Can Wrestling that are mixed in for added effect. Likewise, our advanced Gi Jiu-Jitsu classes are taught by both a BJJ black belt and a world class Judo Black Belt. Throws and trips from Kodokan Judo are emphasized on the feet and this is something that very few schools offer these days. What we produce are students who are well rounded, who know how to perform and defend against takedowns both with and without the Gi, and who know all facets of the ground game, including leg locks, which are another area which many schools neglect because they are afraid of the risk of training with them. However our school stresses safety in performing all techniques, another area that many Poughkeepsie area schools neglect. All too often, BJJ schools are loosely run. We have all seen those schools where every training session is fought like a tournament match, and this behavior causes injuries. At Precision MMA, if an opponent refuses to tap to a submission, then catch and release is practiced, meaning that the hold will be relinquished. We do not have an ego at Precision. We also recognize that upper level belts can be tapped by lower level belts. In fact, we hope that this happens because it shows improvement in the lower ranks. We do not gossip at the end of the day about who tapped whom or make a big deal of it if a lower belt submits a higher one because we realize this is a natural result of regular training. We feel it is important to stress good sportsmanship and the results speak for themselves. Inevitably, if you train with an ego there will be a price to pay, whether it is an injury to yourself or a training partner, or simply a bullying mentality that is fostered. A good Poughkeepsie Brazilian Jiu-jitsu studio should never encourage this. In addition, we provide an atmosphere that is neither too loose nor too formal. While respect for one’s instructors is paramount, the rigidly traditional routines of some schools can be off putting to some students who are new to the Martial Arts. Precision MMA Jiu-Jitsu classes are run so that they are fun as well as character building and we like to think of our coaches as friends, not merely superiors. Precision MMA also emphasizes hygiene and cleanliness in our BJJ facility, which is of the utmost importance these days. With serious staph infections like MRSA and lesser skin afflictions around, keeping the mats sanitized is nothing to take lightly. At Precision our mats are sprayed and mopped after every single class and our equipment sprayed down. Students are also told not to train if they think they may have some sort of skin infection and the instructors keep a keen eye out for them so that nothing spreads. We pride ourselves on being the cleanest gym in all of Poughkeepsie. Another distinguishing factor about Precision’s Brazilian Jiu-jitsu program is our structure: when it comes time to spar we do not choose our own partners without the instructors consent or sit out whenever we feel the desire. Instead, our instructors are careful to place various students together for specific reasons. Perhaps the teacher feels that a newer student needs the help of a senior one, so he will match them up. Or maybe one student will be training for a competition and need to be matched with more skilled students to test them. One student may be injured and need to train with someone more accustomed to going light. Our instructors take all of these factors into account and none of our training is done randomly. 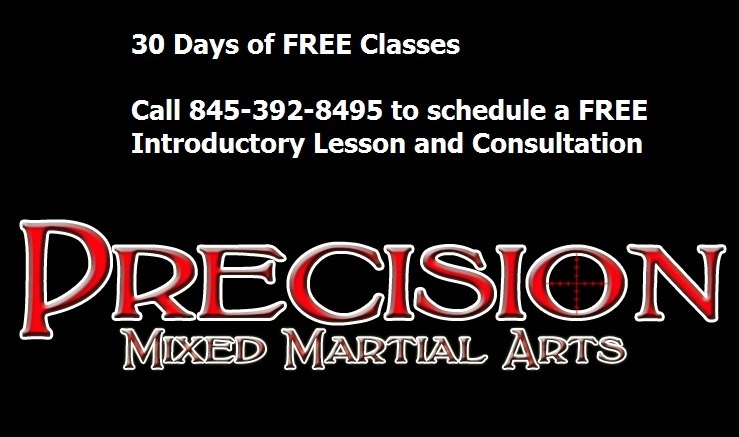 Finally, Precision MMA’s BJJ program caters to the specific needs of our students. We know that different people train for different reasons so we cover all of our bases. Some students train for self defense, and so which moves would be better or worse for a street fight scenario are discussed in class so that everyone is aware that not all moves should be used in all situations. Since some students train for competition, we cover this as well, and make students aware of how many tournaments utilize their point systems. Or if someone is simply at Precision to get in better shape, they can easily achieve this aim since our classes all have serious warm ups and conditioning exercises designed equally to aid with strength, flexibility, cardio and avoiding injuries. We even have instructors who are knowledgeable about diet and who are willing to provide tips on nutrition for those interested in losing weight. Overall, whatever your motivation for training in Brazilian Jiu-Jitsu, Precision MMA’s program will meet your needs. We are confident you will not find all of these aspects covered at just any Poughkeepsie Brazilian Jiu-jitsu school. The proof is in the product, try us out for 30 days of free training and see for yourself. Dutchess County MMA Fighter Brian McLaughlin, owner and head instructor at Precision MMA in LaGrange, NY gives advice on using martial arts as a tool for growth inside the ring and out. In MMA the saying “Whatever doesn’t kill you only makes you stronger” is a very popular idiom. The idea is that the path to personal growth and development is often achieved through a series of unfavorable crucibles. In 2007 I traveled far from Dutchess County to Atlantic City where I entered the Ring of Combat Beasts of the Northeast MMA Tournament. After winning the initial bouts I found myself in the tournament finals. At one point I came across a fellow fighter, Charlie Brenneman, who was a finalist in the weight class above me. We were both waiting for the elevator and Charlie decided to engage me in friendly conversation. “Don’t you just love this?” he asked me. “No! I hate fighting, I can’t wait until this is over” I replied. Charlie gave me a confused sideways look and decided against engaging me in further conversation. While not making many friends, I was being brutally honest. Part of me hates fighting. Whenever I have an MMA match on the horizon everyday is filled with a combination of doubt, fear, anxiety and nervousness. 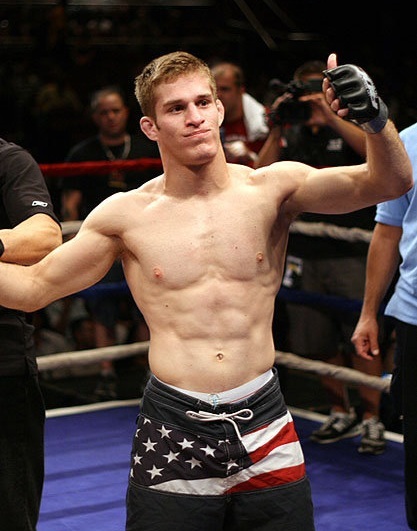 Prior to my first fight my coach had trouble wrapping my hands because they wouldn’t stop shaking. Many people are perplexed when they discover my feelings towards fighting. 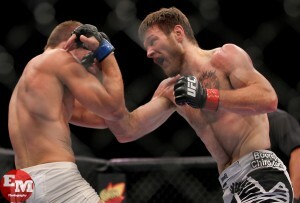 Everyone simply assumes that I enjoy fighting and I’m right at home under the bright lights of competition. When I’m standing in front of a sold out MMA crowd in Atlantic City I really wish I was at home in Dutchess County. Upon discovering the truth I’m always asked why I continue to fight if it makes me so uncomfortable. The reason is that once I went through a professional fight everything else in my life was easy by comparison. I started MMA training at 15 years old. Before I began training MMA, nervousness and anxiety took over nearly every aspect of my life. When I met people for the first time I couldn’t look them in the eye. I used to walk with my head down. I was probably the least confident teenager in all of Dutchess County. If I had to speak in front of a group my voice would quiver and I would start sweating profusely. For my first couple of months sparring terrified me, but it allowed me to face my fears in a controlled and supportive environment. Eventually getting choked, thrown and pinned by someone twice my size wasn’t so frightening. By putting myself regularly in uncomfortable situations I began to relax and my anxiety began to disappear and be replaced with a quiet confidence. The self-assurance and composure I developed through regular training was incredible, but I knew it was the result of facing a real fear and conquering it. In my case, I decided to fight MMA specifically because it terrified me. At the time no one else in Dutchess County had ever fought MMA, I was in many ways entering uncharted territory. Once I had overcome the fear of confronting a professional fighter who was being paid to hurt me I knew I could handle anything. College exams, public speaking, even opening a business were nothing compared to being locked in a cage with someone being paid to hurt you. Anytime I feel anxiety creeping in from a situation I ask myself “is this worse that any fight you’ve been in?”. Now very few things cause me to doubt myself or truly frighten me. By placing myself in stressful situations and confronting my fears and doubts I gained a confidence and self reliance I never thought I’d posses. I truly think a martial artist should at times embrace truly stressful situations or even intentionally create them. I even preach this in my kid classes. When one of my young students hurts themselves they don’t start crying and looking for sympathy, they work through it (Pit bulls not Poodles is our saying). MMA fighting is an extreme example and I’m not trying to get everyone in Dutchess County to climb into a cage. However, I believe everyone should think of ways to challenge them self in training and at times be genuinely uncomfortable. Whether it’s pushing a little harder when you’re completely exhausted or rolling with someone much bigger and stronger than you – when you survive the anxiety you’ll walk away a stronger, prouder person.